Women gathered in front of Amed prison to show their solidarity to HDP Hakkari MP Leyla Güven on her 74th day of hunger strike and demand for an end to the isolation regime imposed upon Kurdish People’s Leader Abdullah Öcalan. Women from Roza Women's Association, Dicle Amed Women's Platform members and HDP Amed MP Remzi Tosun, as well as local women gathered in front of Diyarbakir E Type Closed Prison, chanting slogans. Determined to give voice to the resistance of Güven, women stood in front of the jail despite the intense police presence. After surrounding the crowd, police attacked women. Roza Women's Association chair Adalet Kaya, Dicle Amed Women's Platform Spokesperson Bahar Karakaş Ulu were assaulted by police officers who also insulted HDP deputy Remziye Tosun. 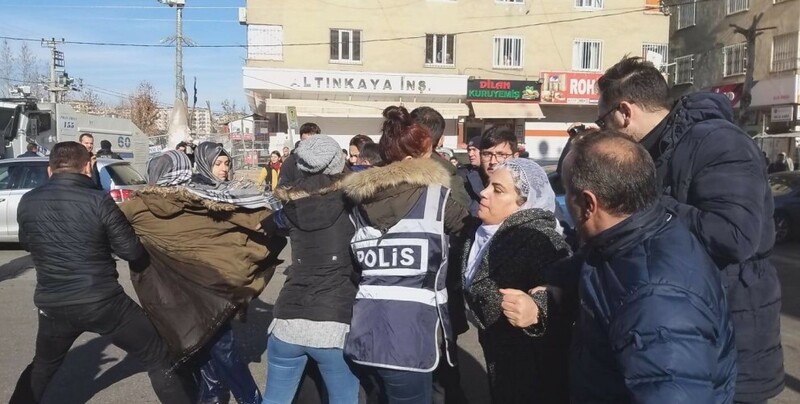 Police attacked the women with pepper gas and water, but women kept their ground and responded back chanting ’Bijî berxwedana zindana’ (Long live prison resistance). HDP deputy Remziye Tosun was hit by pressurized water shot from TOMA (anti-riot vehicle). While women resisted to police attacks, 20 activists were taken into custody. Among the detainees are the following: Roza Women's Association Chair Adalet Kaya, Dicle Amed Women's Platform Spokesperson Bahar Karakaş Ulu, Ceylan Aslan, Gönül Adıbelli and Remziye Tosun's advisor Gurbet Özer.